We believe that a store offering hosting services should have clean, futuristic look to render the message that its products are uptodate. This template exactly suits the above description. Large fonts are clearly legible over the white background. Three hosting plans on top of the page are simple and easy for understanding. Green elements look bright over the neutral layout, nevertheless, they don't irritate the eyes. All featured product images are supplied with descriptions for utmost clients' convenience. A black footer complements the main drop down menu and contains store contacts and social media sharing block in the right bottom corner of the page. 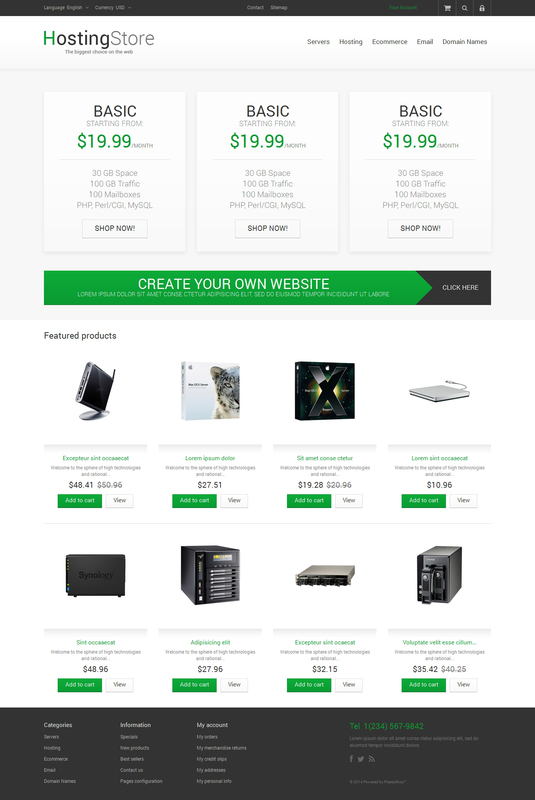 We are sure that this is a decent choice for your future hosting store.